Martin Brodeur missed 50 games with the most serious injury of his career -- a torn distal biceps tendon that required surgery. If his first few days back are any indication, he hasn't lost a thing. Brodeur was back in the crease for the New Jersey Devils Thursday against Colorado and promptly pitched a shutout, stopping all 24 shots he faced in a 4-0 victory. He followed that with a 7-2 win against Florida Saturday afternoon, then had a 27-save performance Sunday afternoon in a 3-0 defeat of Philadelphia -- his 100th career shutout. That kind of performance -- three wins and two shutouts in less than 72 hours -- would be impressive for anyone. For a player who missed nearly four months, it's almost beyond comprehension. But for Brodeur, who's on the verge of breaking the all-time NHL marks for wins and shutouts, it's almost par for the course. What's even scarier for opponents is that a healthy Brodeur is returning to a team that has some serious offensive talent. With a rested, healthy and apparently in-form Brodeur, New Jersey has to be listed among the serious contenders for the Stanley Cup. Jarome Iginla -- Calgary's captain became the biggest point producer in franchise history and a member of the 400-goal club Sunday -- part of a five-point night that capped his 10-point week. Ilya Kovalchuk -- The Atlanta Thrashers made the franchise's all-time leading scorer their captain in mid-January, and he's been on fire ever since. Kovalchuk had 4 goals and 8 points last week, including a five-point night Saturday, when the Thrashers overcame a 3-1 deficit to beat Carolina, 5-3. Zach Parise -- Brodeur isn't the only Devil who's hot. Parise had 3 goals and 7 points in three games last week and now is second in the League with 38 goals and fourth with 77 points. Chris Mason -- Mason looked like a bust for the season's first three months, but since the start of 2009, he's been among the NHL's best netminders. Mason is 4-0-1 in his last five starts and has allowed just one goal in each game. Pekka Rinne -- Rinne is the reason Nashville let Mason go, and he's having a terrific rookie season. He won all three starts last week, allowing just four goals and recording his sixth shutout. Marek Zidlicky -- - Zidlicky was a key to Minnesota's power-play success, but he (and the Wild's power play) have gone cold. The veteran defenseman has no points in his last seven games and no goals in 15. Marty Turco -- Turco was a big part of Dallas' surge after the All-Star break, but he and his team both have cooled. Turco has lost his last four starts for a Dallas team that's dropped out of the top eight in the West. Mikael Samuelsson -- It's not that Samuelsson's isn't getting shots (25 in his last seven games), it's that he's not producing anything with them. He has no points in Detroit's last seven games and is minus-4 in the last four. Jarret Stoll -- Like many of his Los Angeles teammates, Stoll is struggling to generate offense. He has no points in his last six games and is minus-4 in that span despite averaging more than 17 minutes of ice time. Taylor Pyatt -- After scoring 23 and 16 goals the previous two seasons, Pyatt's scoring touch has vanished. He hasn't had a point in Vancouver's past seven games and has just 1 goal and 1 assist in the Canucks' 14 games since the All-Star break. Out -- The Pittsburgh Penguins have been without captain Sidney Crosby for the past three games due to a groin injury. They hope he'll be able to play some time this week. … Minnesota forward Owen Nolan could be out as long as a month after breaking a toe last Sunday at Chicago. … Washington forward Viktor Kozlov, who missed nine games with a groin problem before returning for games Thursday and Saturday, sat out Sunday's game against Florida. … Calgary forward Brandon Prust sustained a concussion Friday and didn't play Sunday. He had missed 31 games with a broken jaw before returning Feb. 19. … Columbus center Michael Peca left Sunday's game in the first period with an undisclosed injury. … Boston forward Milan Lucic didn't play Saturday due to an upper-body injury. … Vancouver forward Jannik Hansen is expected to miss another three weeks with a broken finger. … Anaheim defenseman Bret Hedican missed Saturday's game with a nagging back problem that has bothered him for the past few weeks. … Toronto forward Niklas Hagman missed Saturday's game at Ottawa with a head injury. Defenseman Jeff Finger missed games Thursday and Saturday with an upper-body injury. … Edmonton captain Ethan Moreau left Saturday's game after being accidentally high-sticked in the eye. He was released from the hospital Sunday morning and didn't need surgery. … Florida goaltender Tomas Vokoun has sat for the last four games -- the last two because he's been battling an ear infection. Center Cory Stillman hasn't played for three games due to a foot injury. … Nashville center Radek Bonk will miss at least another week with an upper-body injury. Forward Martin Erat sat out Saturday's game with a groin strain. … Detroit forward Marian Hossa missed the Wings' games Friday and Saturday with a neck injury sustained Wednesday. … Dallas put forward Toby Petersen on IR with a broken foot. He isn't expected back until late March at the earliest. Returning -- The Devils couldn't have asked for a better comeback from Martin Brodeur, who shut out Colorado 4-0 Thursday in his return after missing 50 games with a torn biceps tendon in his left arm that required surgery. Brodeur's return cost 25-game winner Scott Clemmensen his roster spot; Clemmensen was sent to AHL Lowell to make room. … Daniel Briere was back in the Flyers' lineup Sunday afternoon against the Devils after missing 36 games with a groin strain. Philadelphia also expects to get defenseman Kimmo Timonen back Tuesday; he's missed four games with the flu. … Toronto got two defensemen back Saturday -- Tomas Kaberle played against Ottawa after missing four weeks with a broken hand, while Mike Van Ryn returned after missing nine games with a leg injury. … Rangers defenseman Paul Mara was back in the lineup Thursday, just 11 days after dislocating his right shoulder. … Los Angeles activated defenseman Tom Preissing, who missed 22 games with an upper-body injury, though he didn't play Sunday at Chicago. Still out -- Washington captain Chris Clark likely won't be back in the regular season, but could return from wrist surgery during the playoffs. … Buffalo goaltender Ryan Miller doesn't know when he'll be able to play again after going down with a high ankle sprain Feb. 21. … Pittsburgh defenseman Philippe Boucher, who is recovering from a broken left foot, hopes to begin skating in the near future. … Minnesota forward Marian Gaborik is ahead of schedule as he recovers from hip surgery, but still is more than two weeks away from returning. … Columbus rookie Derick Brassard is scheduled to have his surgically repaired shoulder examined Wednesday. He's not expected back this season. … Chicago says injured forward Patrick Sharp "is progressing" as he works to come back from a knee injury. He's missed two weeks and there's no date set for his return. The Hawks hope goaltender Nikolai Khabibulin can start skating sometime this week. He's been out since Feb. 11 with a lower-body injury. The week ahead -- Wednesday's trade deadline looms large over a week in which five teams play four games and just three play only twice. Two of the four-game teams, the Bruins and Islanders, have all of their games at home. Carolina at Washington (March 3) -- The Hurricanes come to town for the first meeting between the Southeast Division rivals in nearly three months. After not playing since Dec. 7, the clubs meet three times in 18 days. Dallas at San Jose (March 3) -- The Stars visit San Jose in the last game played before the trade deadline. Dallas will be trying to avenge a 1-0 home loss to the Sharks eight days earlier. Edmonton at Toronto (March 7, 7 p.m. ET, NHLN-US, CBC) -- The Oilers pay a rare visit to Toronto, where they've had trouble winning for the past 14 years. The Leafs have won eight of the last nine and 11 of the last 13 at home against Edmonton. Pittsburgh at Washington (March 8, 3 p.m. ET, RDS) -- The Penguins end a grueling five-game road trip with their second visit to the Verizon Center in 15 days. Washington and Alex Ovechkin have won all three previous meetings against Sidney Crosby and the Pens. 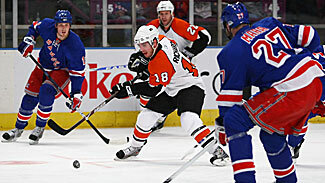 Boston at New York Rangers (March 8, 12:30 p.m. ET, NBC) -- NBC will be back at Madison Square Garden, and the Rangers will try to put on a better show than they did three weeks earlier, when they were beaten 5-2 by Philadelphia. Calgary Flames -- The Flames start a two-week road trip with four games in six nights. They begin in Ottawa and work their way south through Philadelphia to Carolina and Atlanta. Dallas Stars -- After spending most of February at home, the Stars start the month with a three-game, four-night swing through California before coming home for a Sunday night game against Montreal, capping a run of six games in nine days. Minnesota Wild -- Minnesota won't see much of the Xcel Energy Center for the rest of the season -- and none at all this week. The Wild are on the West Coast for the last four games of a six-game trip, starting in Vancouver on Tuesday, followed by a three-game tour of California. New York Rangers -- John Tortorella will get a chance for some practice time with his new team. The Rangers have a four-day break before they visit the Islanders Thursday, then host Boston Sunday afternoon. Ottawa Senators -- The Senators continue their eight-game homestand with another week at Scotiabank Place. This week's opponents include both Alberta teams -- Calgary and Edmonton -- followed by Northeast rival Buffalo on Saturday. Vancouver Canucks -- It's a light week for the Canucks, who play just two games -- both at G.M. Place, where they're wrapping a four-game homestand. Vancouver hosts Minnesota on Tuesday and then has three days off before San Jose comes to town Saturday night.